There are really six marketing methods, but the reminder is that we still have work to do in the marketing/public relations department. Healthcare reform appears to some physicians as doom and destruction looming on the horizon, but it’s not the first time the demise of private practice has been predicted. (The doom-and- gloom accompanying the passage of Medicare back in 1965 comes to mind.) To be sure, we believe that ACA causes serious disruption for providers, employers, insurers, and government agencies! But we also believe in the creativity and adaptability of American business leaders. Medical Practices are sorting it out. There are some casualties, and additional circumstances will bring additional pressures. For example, the growing physician shortage will peak during the years the healthcare market tries to adjust to ACA. Some physicians clearly believe it’s time to plan exit strategies, early retirement, and practice sales. Bailing out would certainly be one way of “adapting,” but we remain convinced there will still be opportunities to run thriving practices in the future—even physician-owned practices. Branding, outstanding service, and high-quality medical care won’t go out of style. Physicians may actually believe that marketing their practices in 2015 could bring in more patients than they could possibly handle. But marketing is about more than trying to increase volume— an effective strategic marketing plan can help a practice attract a “desirable patient base” from the new, larger patient pool. Even if there are more insured patients out there shopping for a physician, not every patient is a “good fit” for your practice. An effective marketing plan does more than attract business— it differentiates the practice, making it stand out against the competition. Establish yourself as the expert in your field. Well-known clinics (like Mayo or Cleveland) have leveraged their expertise into unassailable reputations in the marketplace. Brand your practice. Highlight individual physicians’ areas of interest and expertise, and find ways to communicate them. Don’t be afraid to use logos, Web sites, and consistent marketing to make your practice recognizable among the public. Attract the patients you want. Determine your best patient mix, and allocate marketing resources accordingly. 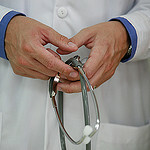 Announce new physicians and services. Make a big deal out every practice expansion. Build relationships with other doctors. With ACA emphasizing team-based care, cultivating referrals will be more important than ever.